If you are working with external agents or independent branch offices, you don't want to spend time micro-managing their business. That is why Onegini Connect allows you to assign the right authorizations to each office through delegated user management. The rest is up to them. Onegini Connect makes delegated user management easy. From your central dashboard you can assign permissions to each of your broker or agent offices. You can then appoint one or more superusers for each office, who will be free to assign permissions and authorizations to each person working at their office. Once authorizations have been assigned, access management can be a time-consuming hassle. To save time and prevent frustration, Onegini Connect uses APIs to link the user management feature to relevant software and database applications in your organization. That way, as soon as you or your superuser have assigned an authorization, the end user can instantly access the relevant applications and start working without getting IT involved. 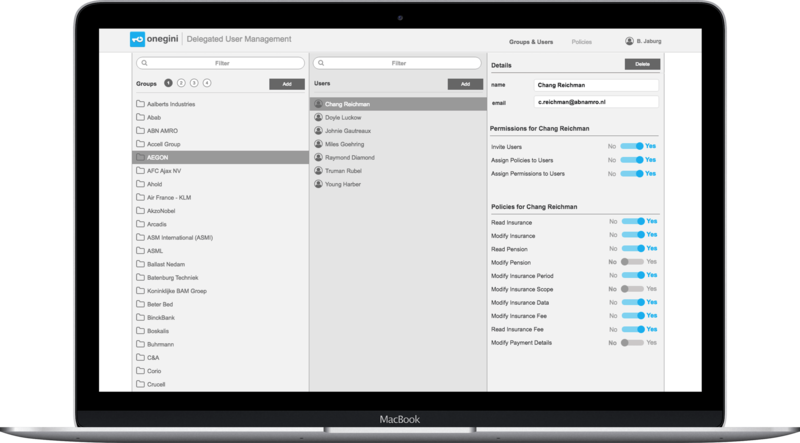 The Onegini Connect delegated user management dashboard is fully customizable to the look and feel of your brand. If you’d prefer to incorporate the dashboard functionality into an existing environment, we’ll give you all the APIs you need to create a dashboard that works for you. Onegini Connect can help you delegate your user management. If you tell us about your situation, we’d be happy to demonstrate our hassle-free solution. Contact us today to get started! Want to find out more about the value of the Delegated User Management?